One year ago today, we welcomed our second daughter, Michaela Byrd, into this world. Her sweet disposition is such a blessing and joy in my life. She is living proof that sometimes God decides to bless you whether you are asking for it or not. I can't believe that 365 days ago, I was riding next to T on the way to the hospital, crying silent tears. I was filled with anxiety. Getting pregnant with this little one had come as quite a surprise. Natalie wasn't exactly scheduled either, but we had both pretty much agreed that we had another year or two to go before we thought about having any more children. Apparently, God had some other plans.... I spent most of my pregnancy moaning over where to put the baby (the guest room, duh), how we would afford the next C-section (God provided! 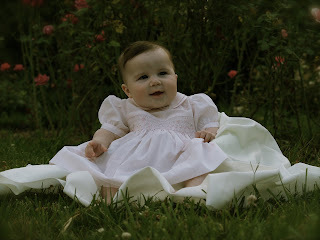 ), and how could I possibly love another baby as much as Natalie (how could I not?)? As I lay on the big table in the OR while the doctor cut and tugged and yanked, those same thoughts rushed through my head. Yet somehow when Dr. S pulled a screaming Michaela Byrd out from the incision (she was clearly unhappy to be introduced to the world two weeks early), those thoughts scattered like pebbles on a dirt road. God filled my heart with a love for her so big, my heart could almost burst these days. She had a rough start with a week-long NICU stay due to some sort of infection, but she's healthy as a horse (or a very small pony) now. She is smiley, friendly, smart, and loves her family unconditionally. She can certainly hold her own. There are tales of her exploits from the MOPS nursery that involve her ganging up on a roomful of baby boys, and she always shows righteous indignation when a precious toy is snatched up by a bullying older sister. Her chatty, sunny personality is a delight to me. Thank you, Lord, for blessing me with this beautiful girl. I am most undeserving! i love, love, love that child. i'm so glad God blessed you, too! what great pics. happy birthday my tiny friend! What a beautiful little girl. Love all the pictures. She's a sweetie. When adding children to a family, mommies have to constantly remind themselves of the math involved...love for our babies ALWAYS multiplies, and never gets divided.